So, there have been a few people who have been trying to get me to read this book for quite awhile now. And for like two years now, I've been putting it off. I am so dumb. I've always judged books by their covers. Something I've never liked about a book is when there are models on the cover, representing characters in the book. It was because of this dislike that I put off reading Gone. Again, I am so dumb. I enjoy most of the books I read. But sometimes, there are certain books that I read that I find are impossible to put down. In other words, Gone was so action-packed and exciting that I didn't sleep at all the night I started it, and I had it finished the next day. Michael Grant really knows how to write. As far-fetched as the idea of a bunch of fourteen-year-olds going crazy and trying to kill each other sounds, Mr. Grant makes the scenario terrifyingly believable. So much so that I'm very glad that, being fifteen, I wouldn't be a part of the world that Mr. Grant has created. Though this isn't a love story, romance does play its part in Gone. I was not overly impressed with how the romance was written, being a bit unrealistic in my mind, but it was nonetheless successfully written, which is more than a lot of authors can say about their books. 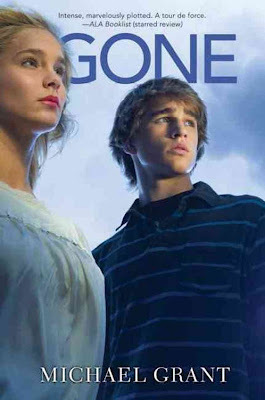 Gone is mainly about Sam Temple. Much like most heroes in teen novels, he is a mostly-average boy. Except when he accidentally burns someone's hands off with his fiery superpower. He's a likable character, and the book is very well written from his perspective. Edilio. This kid is awesome. 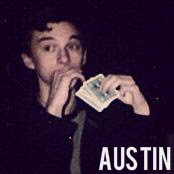 He plays the part of Sam's right-hand-man. He's the guy who is always doing the right thing. He fights the bad guys, and supports the good guys. He's just an all-around good guy. I loved the constant action, and the fantastic writing. Though it isn't something I hate about books, I can't say that I enjoyed the extreme violence of the book. Yes. I already have, to many of my friends.This is a fantastic book for teen readers. It's only because my friends liked this book so much that I read it. And I'm very glad I did. Unfortunately, I'm borrowing this book from a friend, so I can't keep it. But I may just "forget" to return it. Awesome review! I have been wanting to read this series and I am glad that it's highly recommended. This is one of those series I put off and put off, thinking it was too young for me, but I was SO wrong! It's seriously fantastic! I really must read this series. I feel like everyone at Reading Teen has been praising this book for a long time and I have yet to dive into the adventure.